You may want to first be certain that, if, by chance, your relationship with the contractors does not work out, that the contractor is prevented from attempting to sue or file a lawsuit against you in the Civil Claim Court. The contractor may breach your contract/terms of agreement, and you may have to cancel the project because of that. However, if you have nothing in writing to keep that contractor from trying to get extra money from you after the fact by taking you to court, he/she/they could win. Please, examine this document very closely. 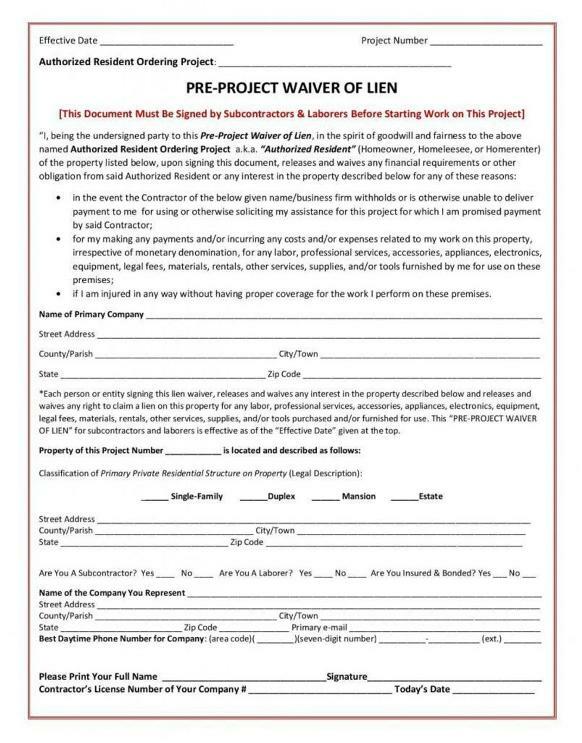 Remember, however, this is only a sample/facsimile of a pre-project lien waiver you may want contractors to sign. It strongly recommended that, if you opt to use this sort of leveraged/legal form, that you confer with a qualified attorney, and have him/her draft the real thing. Just as with the CPPWL, you may want to first be certain that, if, by chance, your relationship with the subcontractors and/or laborers does not work out, that they will not attempt to sue or file a lawsuit against you in the Civil Claims Court. 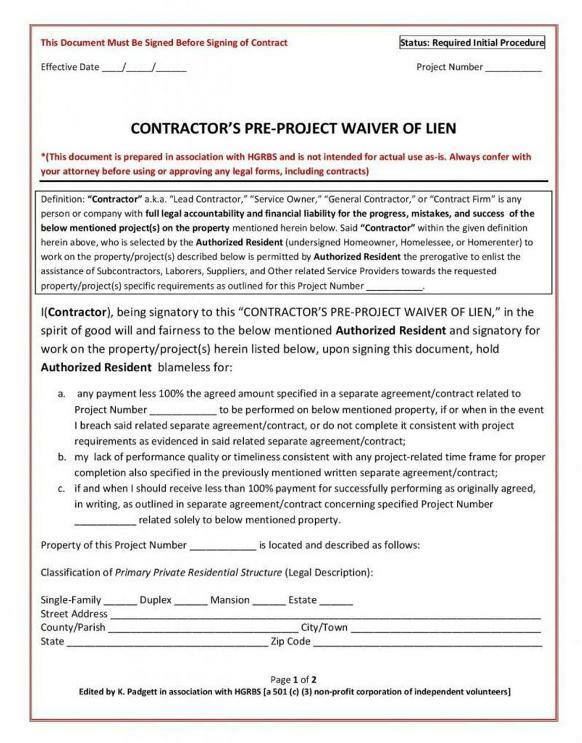 Example 1: The contractor may breach your contract/terms of agreement, and you may have to cancel the project because of that. This would put any subcontractors and/ or laborers the contractor solicited support from out of work. Example 2: You may compensate the contractor either in advance, while the work is in progress. or later. And, you have great expectations that the Lead Contractor will responsibly compensate them for their contribution to your project. But the Lead Contractor disappears without adequately compensating them. In many states, when this happens, subcontractors and laborers can file a series of lawsuits against your property for compensation they did not receive. If you have nothing in writing to keep them from trying to get extra money from you after the fact by taking you to court, they could win. Please, examine this document very closely. that if you opt to use this sort of leveraged/legal form, l that you confer with a qualified attorney, and have him/her draft the real thing.